I have had frequent questions on pruning techniques and optimal pruning times of year for the Japanese Laceleaf Maple, and thought I would briefly list some info that could be helpful. 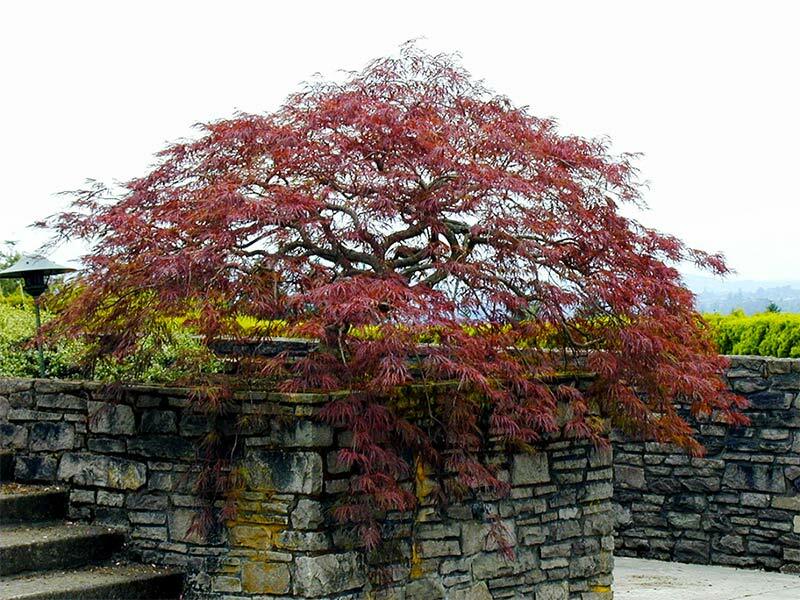 Fall and winter are a common time to prune and shape most deciduous trees and shrubs, but not the Japanese Laceleaf! As a maple tree, the Japanese Laceleaf will bleed or ooze sap. When maples are pruned in late winter or early spring the wounds can be more damaging. If heavy sap flow occurs, pruning should be delayed until it stops or wait until midsummer. Heavy sap flow can lead to disease invasion and weakening of the tree. I recommend pruning maples between mid-July and August, a period when sap won’t run from cuts. The trees should not be pruned during early spring when buds are breaking, during leaf expansion, or in late autumn because the wounds won’t have enough time to heal before winter conditions of freezing or dampness. HOW OFTEN SHOULD YOUR TREE BE PRUNED? Maples should be given a thorough pruning every three years and minor “touch up” pruning annually. A thorough pruning involves removing dead limbs and crossing branches (or branches that will cross in the future). A certain number of branch tips will have died back and these tips can be snapped off with your fingers, or larger branches can be cut with a pruning tool. Remove any shoots growing from the base of the plant whose leaves look different from the rest of the plant. Many maples are grafted onto an understock that in most cases will be more vigorous than the grafted scion. If left to grow, this shoot will take over and out-compete the main tree. Give newly planted trees and shrubs only minimal pruning. Removing too much top affects the production of food energy (carbohydrates) and can result in poor root development. After planting, prune out broken branches and those with weak or narrow crotches. With young trees, leave some of the lower limbs and sprouts even though they will be removed later. These limbs provide the closest source of food energy for root development. I have also found that trees will form a stronger trunk if the lower branches are not trimmed for a few years.